Meet Mimicyu, a ghost type Pokémon that should look pretty damn familiar to you. There’s actually a good reason for that. As Serebii explains, Mimicyu was recently revealed on Japanese magazine CoroCoro. Serebii’s translation of the unveil states that Mimicyu is wearing a cloth costume based on popular Pikachu merchandise. “It wants to be loved by people like Pikachu is,” Serebii says. 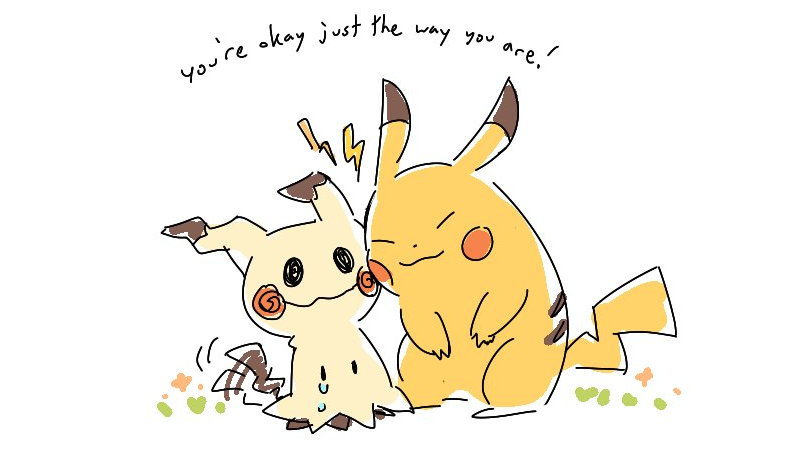 For years, Pokémon developers Game Freak have been trying to one-up Pikachu’s adorable design. Each and every entry in the franchise has had a Pikachu clone of some sort, but none so far has reached the heights that Pikachu has. With Mimicyu, it seems that Game Freak has stopped trying to fight Pikachu’s popularity, and instead is embracing it to great effect. In-game footage, from the latest Japanese trailer. I mean, think about it. Pikachu is the face of Pokémon everywhere. Other monsters living in the world of Pokémon must know that, and considering that Pokémon are intelligent, this means that most Pokémon, at some point or another, have to grapple with feelings of belonging, of jealousy, of envy. As a pet owner I always worry about maybe liking one pet more than the other. I feel a palpable pang of guilt when, say, I find my dog staring longingly at me while I pet my cat. Ostensibly, Pokémon must undergo something similar with their own trainers, especially if they are a critter in a larger family. Right now, Mimicyu hasn’t been officially unveiled for English speakers, and it’s entirely possible that it will have a much different name out in the west. Whatever it ends up being named, I want one.